NBC’s local TV station Web sites, recently relaunched in October as city sites, added Monday (Jan. 26) a new award to honor the best of what cities have to offer, from the best hot dog to the best dry cleaner. Called the Golden Local, the award, established in conjunction with New York creative agency, Mother New York, is part of NBC Local Media’s marketing strategy for its newly relaunched sites. In December, NBC Local Media kicked off the marketing of its new city sites in Chicago, Los Angeles and New York, by holding underground concerts featuring hip-hop artist Common. Golden Local winners will be determined by debate among visitors to the city sites, who will also place votes for the best in their city. To promote the Golden Local, NBC Local Media plans to launch an irreverent advertising campaign across its owned-and-operated stations and the Web sites. Winners of the Golden Local will be awarded “human trophies” that can be prominently displayed outside the local establishment. Two men’s magazines are trying to engage their readers more — by increasing their cellphone bills. Rolling Stone and Men’s Health are both testing programs in which readers can take cameraphone pictures of icons on ads, then send them to a certain number. In exchange, they’ll receive more information or an offer from the advertiser. In Rolling Stone’s current issue, five advertisers are running these offers. They include a motorcycle ring tone for Allstate’s motorcycle-insurance program and a video preview of The Discovery Channel’s new season of “Man vs. Wild.” Men’s Health is going even further, saying each full-page advertisement in its July-August issue will have the added feature. An image-recognition company called SnapTell is behind both magazines’ efforts. Technology from the company, based in Palo Alto, Calif., can differentiate the icon on one advertisement from that on another and text back the appropriate offer. For the magazines, it’s a way to make print products interactive. For the advertisers, the effort is low-risk. Neither Rolling Stone, published by Wenner Media, or Men’s Health, published by Rodale, is charging advertisers extra for the feature. SnapTell, too, is charging the publishers only a promotional price, “but the end business model here is we hope the magazines convince their advertisers to pay a little more for this extra feature, and we would then participate in the upside of the revenues,” said SnapTell’s chief executive, Gautam Bhargava. Advertisers said they were happy to give it a whirl, especially given the cheap price tag, even if they did not see an overwhelming response. BATAVIA, Ohio (AdAge.com) — Procter & Gamble Global Marketing Officer Jim Stengel ranks it among the company’s best digital initiatives, and Chairman-CEO A.G. Lafley called it out to analysts in February as a prime example of innovation. Kiosks are taking info from online to in-store. But it’s not just P&G that’s impressed with Olay for You, an online product- recommendation program that’s attracted more than a million visitors since January, 80% of whom completed an involved question-and-answer process and spent an average of eight minutes on the site. Wal-Mart Stores has begun testing an in-store version of Olay for You via kiosks in stores, marking the latest of several efforts in which offline retailers are looking to tap the convenience and functionality of online tools, such as search and recommendation engines, to improve the often-annoying offline shopping experience. It may not be a bad idea. Even as overall retail sales started tanking late last year, online retail sales were growing at healthy double-digit rates, according to ComScore and Nielsen Online. For the growing number of consumers who prefer the online experience to traditional shopping, the ease of finding products and getting recommendations clearly is a draw, said Carter Cast. Mr. Cast, a former CEO of Walmart.com and head of strategy for Wal-Mart Stores in the U.S., became CEO of fledgling specialty online retailer Netshops late last year. Unfortunately, stores aren’t always anteing up. “I’ve read statistics that show a surprisingly high number of people [more than 10%] will go into a big-box and leave without [buying anything] because they haven’t found what they want,” he said. Though he hasn’t seen some of the newer systems in stores, such as the Olay system being tested by Wal-Mart and P&G, he said they have potential. Mr. Cast also said more retailers will look to mimic the online experience by porting inventory data from their stores to their websites to give consumers real-time information about product availability. 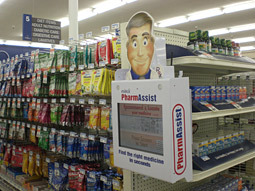 Another take on the online-to-offline phenomenon is Evincii, which began installing kiosks offering a mix of search and recommendation-engine capabilities in the over-the-counter-drug sections of Longs pharmacies in California in 2006 and is looking to roll out the concept nationally. Johnson & Johnson is an initial advertiser on the system, which allows advertisers to place ads similar to online display ads, including video, around search results. But like Google or other search engines, Evincii looks to return “organic” results only based on the criteria shoppers input, such as their symptoms, said Charles Koo, CEO of the private-equity-backed venture. Then, once they’ve selected a product, the kiosk helps them locate it on the shelf. Not only does Olay for You appear to have had unusual success — consumers like the site so much that about 7% have contacted P&G’s consumer-relations staff to say so, more than double the average for online initiatives — it also comes from an unusual source. It was created by Talk Me Into It, a digital agency founded last year by Marie McNeely, a former global equity director on P&G’s fabric and home-care business for Saatchi & Saatchi, which handles creative duties both for Tide and Olay. It’s the first project for Talk Me Into It, which has offices in New York and New Zealand. The idea was largely to help Olay, and consumers, cope with a downside of the brand’s success over the past eight years: A proliferation of products and product ranges has made it difficult, particularly for newcomers to the brand or category, to know what they should buy or even where they should start in making a decision, a P&G spokesman said. While P&G has tried in-store kiosks before with such brands Clairol and Millstone coffee, Olay For You’s combination of a highly graphic, iterative interview process and a soothing female voice may come closest to actually simulating a customer-service rep. But while all the systems sound like good ideas, James Sorenson, exec VP-retail and shopper insights for TNS Sorenson, said getting consumers to search online in the store may be a nonstarter. While consumers might be willing to spend the time to do search queries from the comfort of their homes, doing it in stores is another matter, he said. Mr. Koo, however, said Evincii’s research at Longs indicates that 15% to 18% of visitors to OTC-drug departments use the kiosks, numbers similar to those that ComScore found last year of consumers who use online search to research package goods. Stores using the kiosks, he said, had category sales lifts of 3% to 6%. Lyle Bunn is a principal and strategy architect at Bunn Co. He is an author, presenter, consultant and visionary of the digital signage industry. Social networking. Bluetooth. Mobile commerce. Millennials visiting Web sites and extending music and TV. Each of these are components in the next wave of the digital signage business model. Digital signage has enjoyed rapid growth based on a TV-like ad display model, but the technology that drives the advantages of digital displays has positioned it for a new level of interaction and service to marketers. Digital signage has been an extension of the TV and Internet ad delivery models by moving ad presentation to out-of-home and point-of-purchase. Digital signage is showing up in locations where people gather to work, learn, shop, play, commute and wait. It is also gaining the attention of marketers because it can better target specific demographics, costs less than a typical TV ad and can provide a better compliance report. The number of displays is growing and delivering a viable number of exposures to merit the efforts of ad placement. Ad agencies that have lived with the “TV ad needle” pushed in their arms for years are realizing that media buying profits are based on the broken business model of broadcast. They see that their success will be regained by returning to producing messages that communicate with defined target demographics. This shift includes two significant changes — better message targeting and viewer message interface. Message targeting that has been based on good media buying will increasingly be based on dynamic ad provisioning. The cookies used for internet targeting, the “clicker” history of cable and cognitive recognition in digital signage all have the same objectives, and each is based on technology supporting target marketing. Message targeting is becoming a back-office technology where ads are pulled from storage and displayed based on pre-set “if-then” display rules. Message interface is the new domain of digital signage defined by interaction with the content. While physical interaction has developed through kiosks and touchscreens, the ability to scale is limited. By extending display messaging to a personal device such as a cell phone, message engagement and brand interaction is significantly advanced. This advancement makes digital signage valuable for marketers and communicators wishing to extend ad display into brand engagement. Marketers know the inherent value in using digital signage to gain heightened exposure. Their goal is ubiquity, that at each turn the media is fulfilling customers’ needs, wants and aspirations. SeeSaw Networks has offered a good example of this ubiquity for college students. In some situations students encounter SeeSaw digital signage on public transportation, at the coffee shop, campus locations, gas station, bank, c-store, nightclub and restaurant. The company has managed to incorporate digital signage into each daily destination. Each activity is highly social, so the ads have a high probability of impacting brand awareness for students. Digital signage is part of their social networking including planned activities, destinations and discussions. The Millennial group (those born after 1982) are an attractive demographic for brands. This generation is the first to exceed 100 million people in North America and 42.6 million are currently between the ages of 17-26. According to StatisticsU research, 17 to 26-year-olds in this demographic spend $160.8 billion annually, not including housing payments, utilities and school costs. Ninety-six percent of college students and 86 percent of non-students in this age group use cell phones. Daniel Coates, co-founder of SurveyU, said that this group’s media consumption is shifting dramatically. IDC Jupiter Research valued U.S. mobile “digital commerce” at $11.2 billion for 2007 including downloads and mobile commerce. According to Telephia, the mobile research division of Nielsen, 31 million people used mobile Internet in June 2007. Comsource forecasts mobile Internet to increase to 92 million by 2012. Through interactivity digital signage serves as an excellent media platform to reach Millennials and other demographics through text code (SMS) downloads, direction to Web sites, blue-casting and permission marketing. SMS Text. Text codes presented in a digital ad could prompt the download of information, coupons or media such as ringtones, wallpaper or games. A text code could also enable a mobile commerce transaction. Mobile commerce provider mPoria reflects that the average mobile commerce transaction is $130 with conversion rates of .8-1.5 percent on mobile devices. Bluetooth. Beyond text codes, the digital signage media platform can serve as the interactive media supply point for near-field communications using Bluetooth. According to a February 2008 report by NPD Group, 69 percent of phones sold in Q2 2007 were Bluetooth-enabled, a 48 percent increase over Q3 2006. Over 40 percent of users with Bluetooth use the capability. TruMedia’s audience measurement tool detects gender with 90 percent accuracy. RFID technology has had limited deployment, but like barcode readers or other near-field communications, offers a viable trigger for content display customized to the viewer experience. Facial recognition. Digital signage is ideally suited to serve ads and other content based on the audience profile of its viewers. Cognitive facial recognition can determine the gender, age range and ethnicity of a viewer. This information can then be used to trigger the display of content suited to the viewer. Using this approach, one ad may be displayed for a 50-year old white male while a different ad is presented for a 20-year-old Asian female. As digital signage moves from playloop ad display to a media platform approach, a new model of ad placement and payment is made possible. Increased ad revenues are realized when audience recognition reports on actual ad viewers and ads are displayed especially for targeted audiences. Revenue is also generated by SMS text or mobile commerce interactions triggered by the digital signage content. Dynamic ad provisioning from facial recognition suggests an entirely new revenue model from better message targeting. In this revenue model, content is developed for locations where targeted viewers are expected. The content is placed in storage on the media player at that location for playout when triggered (rather than simply placing the ad into a playloop). The invoice for the ads is validated by a report of the viewers. CognoVision and TruMedia both offer audience recognition products for this model. This same report could fuel the creative development of the ad to maximize viewer awareness and engagement. The challenge of reaching consumers and viewers has motivated the development of new technologies and business models. As digital signage continues to evolve, its strengths are exploited and inter-relationships are refined, all to the benefit of savvy communicators.